On May 1st. 2017 we started our first season at the well-known Brasseriet in Gilleleje. We took over from Søren & John Puggaard, who previously created Schønnemann, which is an iconic restaurant when it comes to the traditional Danish open sandwich, along with sandwich maker Jytte Støvlbæk, also known as The Countess, within the world of open sandwiches. We are proud to have Jytte Støvlbæk in our team at Brasseriet. Jytte is an experienced and well respected sandwich maker. Jytte has been involved in the opening of many of the traditional open sandwich restaurants in Copenhagen. She makes everything from scratch and has carefully chosen the ingredients to each open sandwich. Jytte takes great pride in each piece, so that you can enjoy an open sandwich which will talk to your senses. Nothing is random, which is also why we can’t make changes to the open sandwiches. The owner Berit Bjørnestad is a qualified Chéf with more than 20 years of experience. 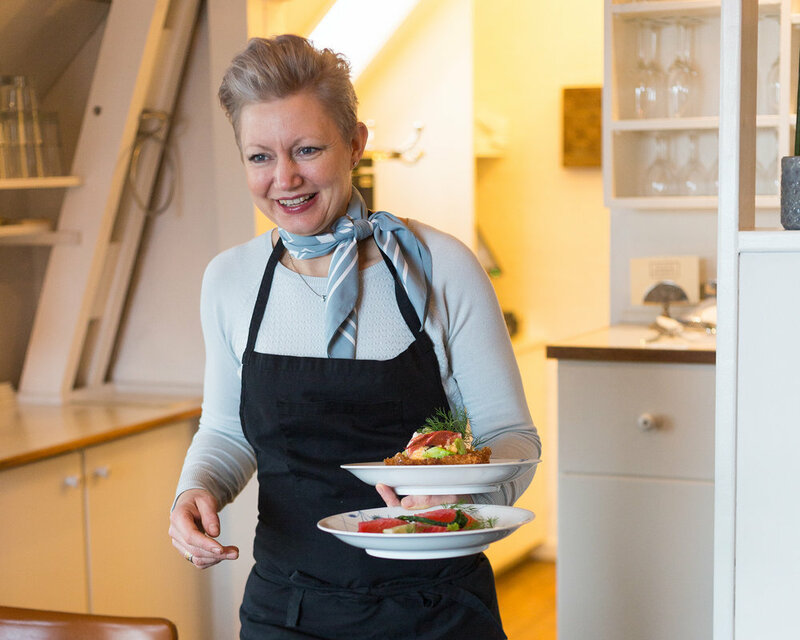 Berit is born and raised in Gilleleje, but for some years she ran different different restaurants in the area around Frederikssund, but has now returned to her home town. Berit brings pride and skilled craft to the table and has an eye for good quality. She is determined to create the ultimate dining experience for our guests. Berit creates our evening menu, using the various seasons available fish and vegetables. Nothing is random, which is why we can’t just “mix something up”. We are looking forward to making Brasseriet the best place on the North coast, to enjoy a classic and traditional Danish open sandwich or a tasty dinner in a relaxed yet luxurious restaurant. We aim to provide our guests with a “top of the range” dining experience, served with a smile from our friendly staff and in a festive atmosphere.